A prayer hall of 45 sq km dating back to 700 to 600 BC and Kharosti script are some of the other notable evidences. 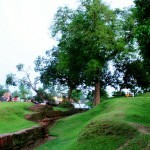 Some historians believe that Chandraketugarh and adjoining areas is the place that was referred to as “Gangaridai” by the ancient Roman and Greek writers. The place derived its name from the urban civilization Chandraketugarh that flourished in this place for some six eras, under the rule of the mythical King Chandraketu. The civilization existed from the pre-Mauryan period to the Pala period. Places to see at Chandraketugarh: The tourist attractions mainly comprises ancient ruins such as the mythical ancient temple dedicated to characters like Khana and Mihir and the Chandraketugarh Fort that is built by King Chandraketu. The site housing both of these structures is called ‘Khanamihirer Dhipi.’ As per the Archaeological Survey of India (ASI), the temple belonged to the period of 4th century BC to 12th century BC and was part of the flourishing urban settlement, Chandraketugarh. The temple is considered the most important archaeological structure of the region with only a flight of stairs and the walls as the remnants of the building. The ruined four-feet thick walls reveal the grandeur of the temple. The other things found during the excavation of this temple are Buddha stupas and images, decorative designs belonging to Pala period, Jataka stories coins, terracotta sealing and plaques and many more. The ruins of Chandraketgarh Fort were excavated in 1956-57 and the small field situated in front of it provides an ideal spot to the tourists. Cast copper coins, silver coins, coins of Gupta and Kushana period, different kinds of beads, terracotta plaques and figurines of Sunga, Maurya, Kushana and Gupta periods and various other antique pieces were found, during the excavation of this place. Nearby attractions of Chandraketugarh: The other interesting structure nearby is the legendary incomplete mosque that was built by Pir Gorachand and his followers in Haroa. Historians believe that the mosque was built on the ruins of a Buddhist stupa, which was built some 1300 years ago, during the time of Jesus Christ. A ‘darga’ of Pir Gorachand is also situated at a distance of Haroa bus stand. You can also visit the Lal Masjid by availing a cycle-van from the Haroa bus stop. A visit to the Bidyadhari Bridge can be interesting for those wanting to avail a grand view of the river. While returning, you can also visit the erstwhile home of the legendary Bengali actor Chobi Biswas at Chandraketugarh. Things to do in Chandraketugarh: You can explore the various archaeological structures and the history and legends associated with them. How to reach Chandraketugarh: Chandraketugarh is situated at a distance of about 50 kilometers from Kolkata and can be reached by road, via Barasat. The journey takes around 2 hours. From Ultadanga and Espalanade, regular buses are available to Barachampa. From there, you can easily reach Chandraketugarh. Best time to visit Chandraketugarh: Any time of the year but try to avoid the rainy season. Also, Basanti Puja is held with much fervor at Chandraketugarh. Lodging facilities at Chandraketugarh: There are no such lodging facilities here. Chandraketugarh is appropriate for day trips from Kolkata. Dining facilities at Chandraketugarh: Chandraketugarh don’t have eateries but a number of them are situated in Haroa and Barachampa.